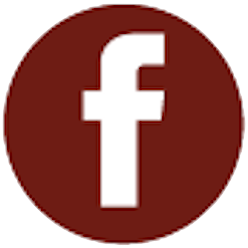 Posted April 22, 2017 by Paula & filed under Member News, Press. THE UMPQUA VALLEY has a streak of wildness to it. Sparsely populated, its towns lie scattered amidst a series of rugged, undulating hills thatched in spikey Douglas fir and black oak. The Umpqua River and its winding tributaries churn and tumble through a network of valleys formed by the collision of three mountain ranges—the Klamath, the Coast Range and the Cascades—before emptying into the Pacific Ocean. In the 1800s, prospectors dredged and panned sandbars of the South Umpqua and the Rogue rivers, in search of matchhead–sized nuggets of gold. It’s this dramatic history and landscape that colors the region, whose wines I had never tasted despite 15 years in the wine industry, most of them spent in the Pacific Northwest. As I would quickly learn on a pre-harvest junket in 2015, the wines from the emerging Southern Oregon AVA are as complex and surprising as the terrain itself. On that cloudless mid-summer day, I found myself squinting into bright afternoon sunlight, listening to winemaker Earl Jones of Abacela Vineyards & Winery as he explained the significance of the Klamath-Coastal fault line that runs through his tidy south-facing vineyard blocks. 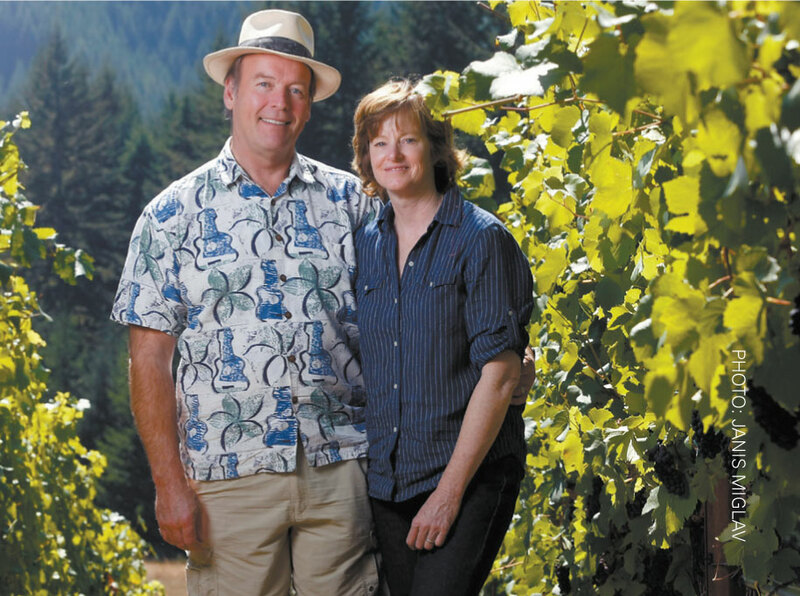 Looking more like an archeologist than winegrower, clad in khakis and a weathered hat, Jones explained the rationale behind his risky decision to plant Spanish varieties in the Umpqua Valley. Jones also crafts bone dry Albariños with amped-up acidity that show complexity and restraint. The most recent vintage delivers lemon curd, dried pear, star fruit and white flowers—taught and lean with an arching acid spine and subtle minerality that reads as talc, wet stone and marjoram blossom. Dubbed the “Hundred Valleys of the Umpqua,” Jones’s property lies in the warmer southern end of the AVA. Evergreens give way to rolling oak savannah, and the site lies within a rain shadow created by the Oregon Coastal Range and portions of the Klamath Mountains, well shielded from the marine air that cools the AVA at its northernmost tip. The kind of complex faulting found in Umpqua Valley, and particularly in Abacela’s vineyards, produces dramatic variations in soil types over small areas. Earl’s vines dig deep into mixed clay, silt and cobble-sand soils; there are five distinct soil types in all, with heavier more clay-laden soils at lower elevations. “We didn’t know anyone in Elkton,” he laughs; “it’s got a population of around 170, but we put an offer on the vineyard property where we originally thought we would put up our production facility in 2002. We bought the lot in Elkton. I designed the building. I brought the plans into the town clerk, she looked them over for a minute or two and said, ‘Looks good to me; go get a building permit’—that was it! I like to tell people how hard it was.” Elkton is the only true coastal region within the Umpqua Valley, the burgeoning sub-appellation lies just 36 miles east of the Pacific Ocean, and as in many of the coastal AVAs of California, cool air is funneled in from the ocean and channeled along a gentle grade that facilitates a strong maritime push. “Our own vineyard sits at a 1,000-foot elevation, just 25 miles from the coast. The geography of the Oregon Coastal Mountain Range is composed of layers of ancient seabed stacked up like an accordion. Our soil is quite red—the older a soil gets, the redder it gets; when we dig down, we get into limestone,” says Terry. 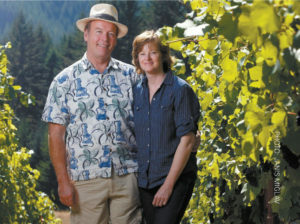 Similarly, Stephen Reustle and his wife, Gloria, came to the same conclusion in 2000—that the Umpqua Valley would be the ideal spot for growing the varieties they love. And like Jones and Brandborg, Reustle combed through prospective sites from Temecula to the rolling hills of Walla Walla Valley. “We left the East Coast and moved to San Francisco, which I then used as my base of operations to search for the ideal property to make world class wine. I put money down on 200 acres in the Anderson Valley and was considering another site in Sonoma. On a whim—we were just two weeks from closing—we decided to look at property in Tualatin. I wasn’t impressed, and my wife and I were in a Winnebago at the time. She’s from the Caribbean; it’s not a culture that camps!” The Reustle–Prayer Rock Vineyard Syrah is a wine that conjures freshness, with pitch perfect acidity. Notably, Reustle was the first winery to commercially produce Grüner Veltliner in the U.S., a variety he crafts with a deft hand. This flight, poured alongside a Grüner Veltliner from Pichler-Krutler, in Austria’s granitic Wachau region, was richly perfumed with blanched almonds, mandarin orange, wet pomace, anise, green tea and pear. Aged in concrete eggs, they exhibited textural elegance and a soaring inner tension that crescendoed with a spicy streak of white pepper and mâche. Tasted blind, it was almost impossible to single out the Grüner Veltliner from the Wachau. We transition from Grüner to Syrah. A pair of 2014 Estate Syrahs and a 2010 face off against a Paul Jaboulet Aîné 2010 Domaine de Thalabert Crozes-Hermitage. The parallels between this smoky Northern Rhône and Reustle’s Syrahs are astonishing. His 2010 Estate Syrah is particularly riveting, with its cascading aromas of black olive,steeped blackberries, serrano ham, graphite and violet pastille. It’s a wine that conjures freshness, with pitch-perfect acidity lending balance and grace to layered black fruit, finely sueded tannins and a cracked black pepper finish. It’s clear that Reustle’s research and care have paid off; his 2012 Masada Bloc Syrah won first place at the 6 Nations Competition in Sydney, Australia. 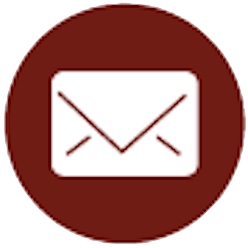 Since that time, his Syrahs have won Double Gold at the San Francisco Chronicle Wine Competition and Double Platinum awards in other highly competitive wine competitions. Most recently, the winery was named 2017 Pacific Northwest Winery of the Year. Is it European or is it Umpqua? Umpqua Valley Old World varietals—such as the Brandborg Pinot Noir, Reustle–Prayer Rock Vineyard Syrah and Abacela Tempramillo—left many of our panelists stumped. 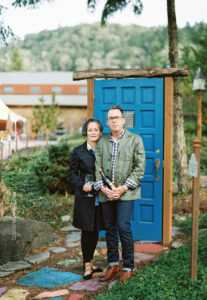 I recently had the chance to catch up with Jones and his wife, Hilda, this time at a blind tasting coordinated by The Somm Journal, held at Portland’s cozy Le Pigeon. A group of wine buyers, beverage directors and somms gathered to see whether they could find the 90-plus-point European wine in each flight of four wines. The warm and cool-climate varieties showcased by Umpqua Valley’s top producers, collectively known as the Big Three—Abacela, Brandborg and Reustle–Prayer Rock Vineyards—perfectly illustrated the range of wine styles the Valley produces. The tasting commenced with an expressive, onion skin–colored flight of Gewurztraminer. (As in Alsace, the umlaut is generally omitted on this varietal name in the Umpqua Valley. —Ed.) Heavily laden with tropical notes of lychee, lemon drop, linden blossom, cinnamon and white pepper, Brandborg Vineyard & Winery’s Gewürztraminers struck a chord with tasters, who for the most part had trouble differentiating them from an Alsatian contender, Domaine Ostertag. 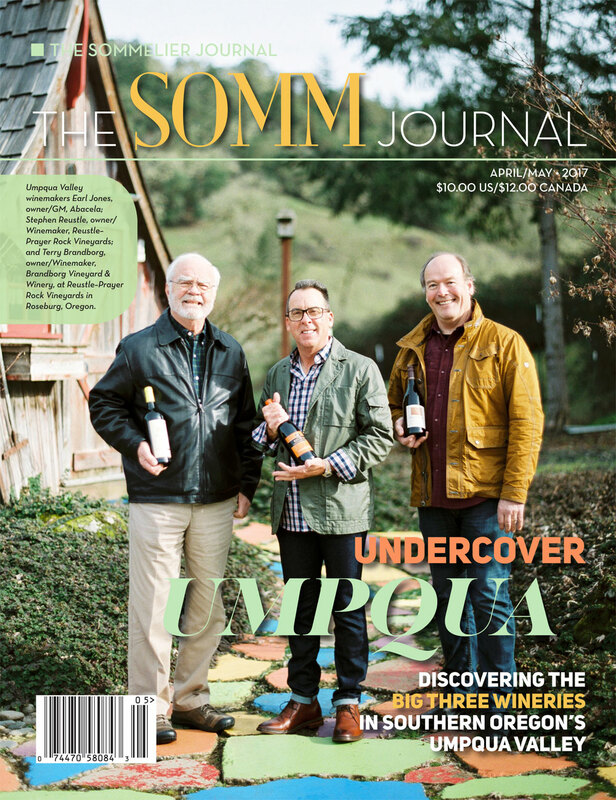 In terms of energy—that hard-to-define nervy pulse that courses through weighty, fruit-filled layers—the wines from Umpqua Valley were as poised and imbued with minerally élan as their European counterpart. Terry Brandborg’s Pinot Noirs, tasted with a Gevrey-Chambertin from Louis Boillot hidden in the flight, showed equally well. With a profile more red-fruited than black, offering up tart pie cherries, raspberries, rhubarb compote and baking spice, set against an earthy backdrop; they are as elegant as any of their northern counterparts from the Willamette Valley. For the final flight, Abacela’s inky and opaque Tempranillos radiated warmth and gravitas. Waves of roasted black cherries and plums emerged from over the course of the flight, followed by more ethereal notes of brick dust, dark chocolate shavings, tomato leaf, leather and char. Awash in concentrated black fruit and fine tannins, Abacela’s Tempranillos are wines with substantive energy and power. The outlier in the flight, Bodega Numanthia’s 2011 Numanthia Toro, was mistaken for one of the Tempranillos from the Umpqua Valley. In a group of 20 tasters, all but two thought that the Abacela 2005 Reserve Tempranillo was the European wine. “Those of us who believe that a rising tide floats all boats, we’ve rolled up our sleeves and we’re trying to bring more attention to the region,” confided Terry Brandborg. 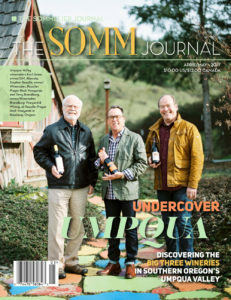 Despite the fact that its earliest plantings predate those of the Willamette Valley—Richard Sommer was the first to plant Pinot Noir in Oregon—Umpqua remains eclipsed by its northern sister. I had, after all, moved back to Oregon after an absence of nearly 20 years with the intent of focusing on Willamette Valley’s excellent Pinot Noir and Chardonnay wines. Since then, subsequent visits to Umpqua and this tasting have convinced me to broaden my scope. I was struck by the emphasis that all three winemakers placed on climate over soil; all three have crafted varietal wines of great pedigree and finesse. And all the wines featured by The Somm Journal rivaled—and perhaps even transcended—those from some of the celebrated producers in the Old World. Europe does indeed exist in our backyard.